A man who died after being seen covered in blood, in just a pair of shorts and socks, trying to get into people's cars, has been named by police. The Staffordshire force said a post-mortem exam carried out on Joshua Ball on Wednesday was inconclusive. Police attended reports of a man in a distressed state in Packmoor, Stoke-on-Trent, on Monday. A spokesperson said Mr Ball, 26, was detained by officers and went into cardiac arrest on route to hospital. The force has referred itself to the police watchdog. Police, who described Mr Ball as local, said witnesses reported he attempted to get into two cars that were driving in the area. 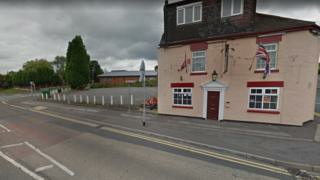 He was detained in Pennyfields Road, near the Dog and Partridge pub, at about 14:00 BST and taken to hospital by ambulance. He was pronounced dead at about 18:20 BST. "As there was police contact with Joshua before his death, we have voluntarily referred ourselves to the Independent Office for Police Conduct (IOPC) as is standard practice," a police spokesperson said. Further tests to establish the cause of death are due to be carried out.